A barrage is a term used to describe continuous artillery fire (using guns and projectiles) on several enemy positions. Barrages were classified as light, moderate or heavy. A light barrage amounted to six or seven shells every ten minutes. A moderate barrage was thirty shells a minute and a heavy one, fifty to sixty shells a minute. Barrages were used offensively and defensively. HOW WAS BARRAGE WARFARE USED IN WORLD WAR I? There were several different types of barrage used during the First World War. A box Barrage was artillery fire aimed around a target area to prevent the enemy command from sending in reinforcements. A Pin-Point Barrage was an attempt to wipe out a machine-gun post or a deadly sniper. A Search Barrage involved using reports from aerial observers and spies on the ground to destroy important targets such as army headquarters, ammunition stores or opposing artillery batteries. A Counter-Battery Barrage was an artillery fire targeted against enemy guns. Barrages were most used by the British Expeditionary Force at the beginning of World War I. It wasn't until after 1915 that barrages became a major strategy of both sides. The most common barrage used in World War I was the creeping barrage. A creeping barrage is when artillery is rapidly and continuously fired just ahead of an advancing infantry. It was a versatile strategy which meant the movement of the artillery fired and infantry behind it could constantly shift - or creep - forward directly ahead of attacking troops. The creeping barrage led to other forms of barrages that combined use of artillery, infantry, tanks and aircraft for large-scale attacks. WHY WAS BARRAGE WARFARE USED IN WORLD WAR I? 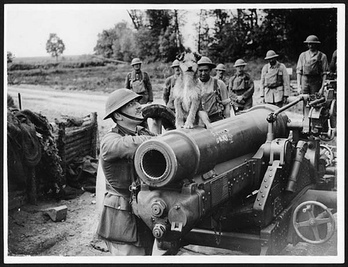 In late 1915, the British realized that artillery barrages could stop the enemy quickly and could provide cover fire for their troops as well. This was the key to breaking into German defensive positions. So, by 1916, the creeping barrage was the standard means of deploying artillery to support an infantry attack, with the infantry following the advancing barrage as closely as possible. The innovation of the creeping barrage was a valuable discovery because it allowed the military using the strategy to stop the enemy with artillery fire rather than destroy them. It was also discovered that a moving barrage immediately followed by the infantry assault could be far more effective than weeks of bombing and then moving in the infantry. Barrages were not just used on land but at sea and in the air as well. Naval barrages were barrages used by the navy at sea. A sea the most effective type of barrage was the mine barrage. Mines barrages planted a garden of mines at sea in an area where the enemy was known to travel through. Originally, these barrages were used to deal with submarines, however, strategically placed mines could destroy entire enemy fleets. Hot-air balloons were not a new invention but the use of them in war was a new innovation. No one had thought to use them in wars before. Hot - air balloons called observation balloons were sent up in groups with two or three men in each of them. The men would observe what the enemy lines across no man's land looked like and would get the information about the enemy to their commanding officers by using flags or by radio. Balloon operators would generally remain in the air for hours at a time. It was regarded as a dangerous job. Though observation balloons were protected by machine gun fire and by wire meshes that were dangled between groups of balloons, they were easy targets for the enemy to shoot down. Balloon operators had parachutes to escape if the balloon was shot down, but the chance of escaping the enemy were very slim! Balloons were also used for defending the homeland. There wasn't major fighting on American soil, but in Europe it was a problem. Being so close to each other, each European country was subject to enemy attacks. Balloons were flown in groups with cables in major cities such as London. The steel cables hanging from the balloons formed a shield that trapped attacking enemy aircraft like a spider web. Enemy aircraft had to then fly higher away from the country's land which reduced the chances of an accurate bombing raid. barrages were usually very effective. They were a great way to mess up the enemies' position because the enemy was not able to move through all of the firing. The enemy would eventually have to surrender or die. Ground barrages also had disadvantages. Ground barrages could kill large amounts of soldiers at one time but was unable to take control of the land that it gained long enough for the infantry to advance. So unfortunately, there were times where a large amount of artillery was wasted in a barrage that did not gain any of the enemy territory. Naval barrages had advantages and disadvantages as well. Mines are effective in naval warfare because they are not seen until a ship is basically on top of it. The disadvantage is that the mine has to be hidden well. A mine has the advantage of striking a ship in the underwater portion of the hull. Damage to this area of the ship almost always sinks it. The problem is that mines are only effective if they are submerged enough under the water so a passing ship will sail into it setting off the firing mechanism. Mines were an inexpensive way to wage naval warfare. Unfortunately, they were not inexpensive to clean up after wars. If a mine was not detonated in war, any ship that passes over it would detonate it, potentially killing innocent people on merchant ships or passenger ships. Hot - air balloons gave a bird's eye view of the enemies' trenches, weapons, and strategies. They also were able to withstand standard bullets. Hot - air balloons below 1,000 feet were easy targets for projectiles on the ground; however, airplanes had to be careful when shooting down the balloons under 1,000 feet because the explosion and fire of the balloon would land on their own infantry troops killing their soldiers.